When I arrived at the Vrijthof, there was already a crowd of people waiting at the ice rink, so I couldn't get any nice place to see everything. The opening started with an acrobatic ice show, which was about an half hour long performance of several artists on the ice rink with a music accompaniment. At first came artists on stilts, which was pretty cool. I wondered how they managed not to slip, but they were walking on the part of the rink that was covered with a carpet. After that several solo figure skaters showed their skills. At the, group of 5 figure skaters danced into the music of a famous musical. I really enjoyed it, even though I could not see everything properly, as I am not tall enough . I tried to make some pictures, but I was not really that successful. Never mind. 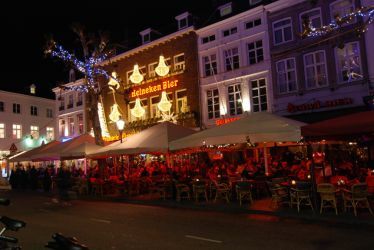 Christmas market in Maastricht was hereby opened, good time to walk around as see what it offers. Obviously, there are several stalls with various food and drinks. You can buy there typical Christmas market beverage "Gluhwein" (mull), one glass costs 3€ 2€ deposit for the cup. Then there are several stalls selling various stuff – calendars, funny T-Shirs, stuffed animals, boots, clothes, small presents, ceramic figures etc. For small kinds there are several attractions – long slide, merry-go-around and for everybody also a big wheel with Vodafone logo (entrance 10€). Near the ice-rink there is also some kind of a restaurant where you can sit and it is covered, which is useful in case of a bad weather. All square and city is decorated by lights, to make you feel the atmosphere. Well, I hope there will be some snow, otherwise I find that personally only waste of scare resources as is not that beautiful. But I haven't seen any Christmas tree anywhere, maybe I was not looking properly, but I suppose such thing should be tall and not that easy to overlook. A met another Czech people! There is a related photogalery containing 47 photos to this article. Go to the photogallery. Article last edited 9. 12. 2011, viewed: 965-times.